A few days ago, I purchased an Amazing-E EVSE. I already had a Level 2 (240V) EVSE permanently mounted in my garage, but I was really looking for a portable 240V electric car charging cord. Ideally, that portable EVSE could run on 120V as well. 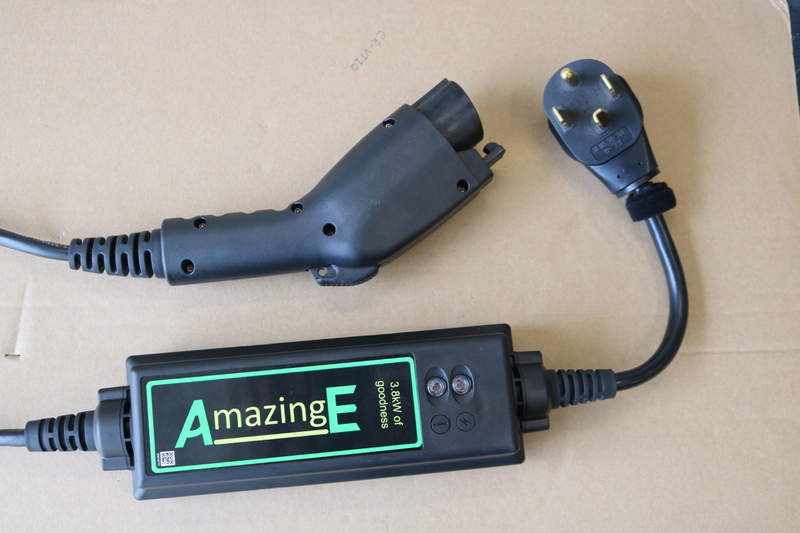 The Amazing-E appears identical to the Gen. 2 Chevy Volt EVSE, which has been found to be 120/240 volt compatible. Was it possible that this EVSE was not only inexpensive, but also dual voltage? I’d have to give it a try to find out. To start with, it is a 16A portable unit. It’s compact and has a thinner, lighter cable going to the J1772 cable. There’s just a simple Velcro tie to use when coiling up the cable. The EVSE also came with three bright green tote bags. Use one to carry the EVSE, and the other two for groceries. At the wall plug end of the EVSE is a NEMA 14-30 plug. This is a solid connector with nice molding and strain relief built in. Personally, I would have preferred a NEMA 14-50, as there seem to be many more of those electric outlets at RV parks, state park campgrounds, and other places a person might encounter 240V power in public. Also, I already have 3 14-50s in my garage! Oh well. A new outlet was about $8 at the big box home improvement store, and it was easy to swap out. 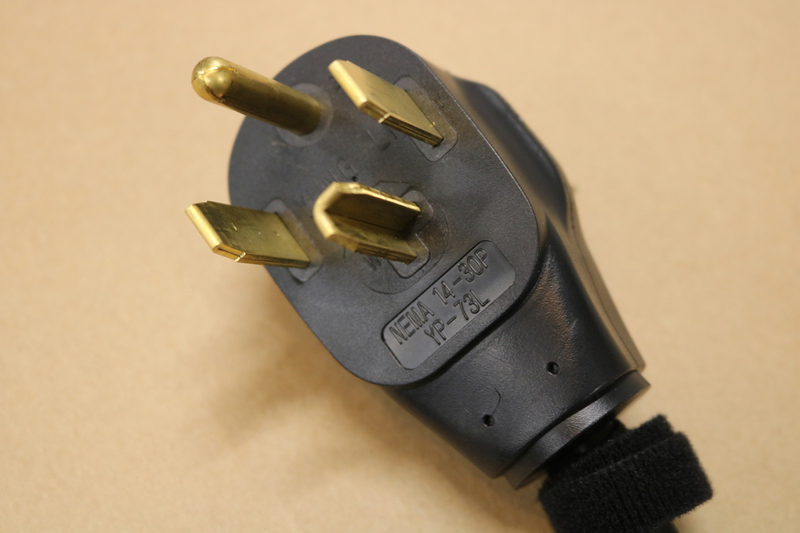 It would also be possible for a person to build a plug-in adapter from 14-30 to other 240V outlet styles. Interestingly, the ONLY difference between the NEMA 14-30 and NEMA 14-50 is the shape of the neutral blade. 240V EVSEs typically do NOT use the neutral, and in the instruction manuals of this one it’s specifically stated that the neutral is NOT used. Because of that, a person could actually CUT OFF the neutral pin and then have a plug compatible with both 14-30 and 14-50 outlets! On the back of the box are two keyhole connections that mount on screw heads. The instruction manual also specifically states the distance between the two screws, making it easy to lay them out. I put to screws into my garage wall and hung the EVSE on it. The EVSE hangs pretty well, but could be knocked off fairly easily. I guess that’s one disadvantage of a “portable” unit. It would be easy to add a zip-tie, Velcro, or some other simple attachment to make the connection to the wall more secure. I plugged in the unit and turned on the circuit breaker. The green power light comes on and the red fault light blinks once as part of a quick boot up sequence. After that, it’s ready to go. I plugged the J1772 connector into my Mitsubishi iMiEV electric car, and charging went great!. The next step was to look inside the EVSE. I got out my “Tinkerer’s Toolkit”, a set of bits for tamper-resistant screws. If you want to void warranties, this is the tool set for you! The body of the EVSE is held together by 8 screw which have a star shape with a dot in the middle. I found that my VT10 bit was the correct one, and set to work removing the screws. All visible components inside are rated for at least 240VAC. I looked to see if there were any components that appeared to be designed for 120V AC ONLY, but didn’t immediately recognize any. 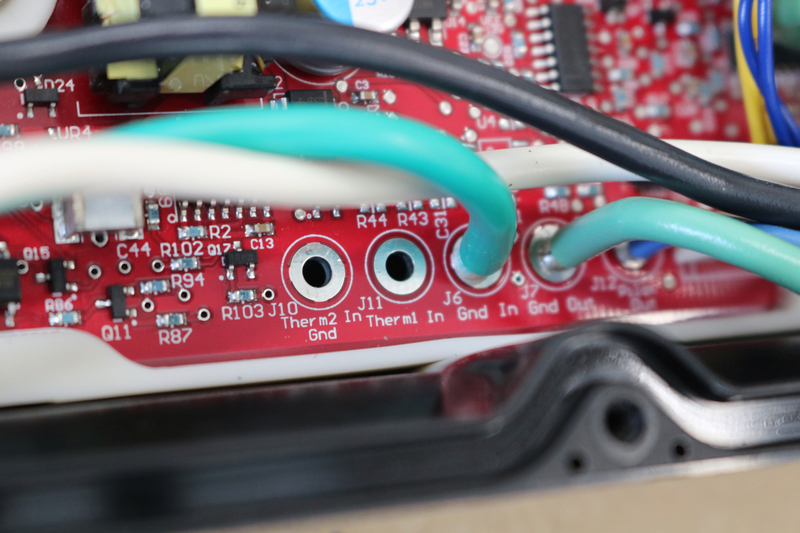 On the power input end of the board, the wires from the 14-30 plug are soldered in to the PCB. The black, red, and green wires are soldered directly in, but the white wire (the neutral) is simply cut off and then sealed with a piece of heat shrink. So there you have it, the neutral is NOT used at all. It’s literally hooked up to nothing! The black and red wires go to holes marked “Line_1 In” and “Line_2/N In”. 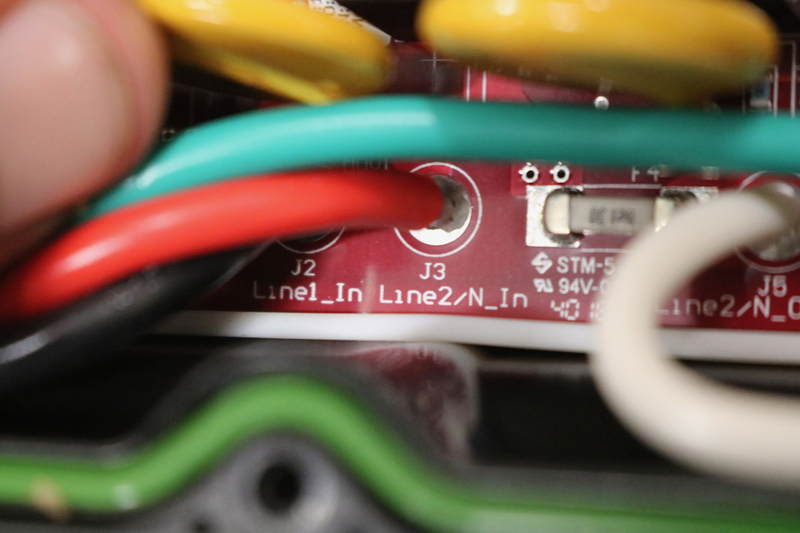 The N of the line 2 implies that the same connection on the board could be used for Neutral in a 120V system. 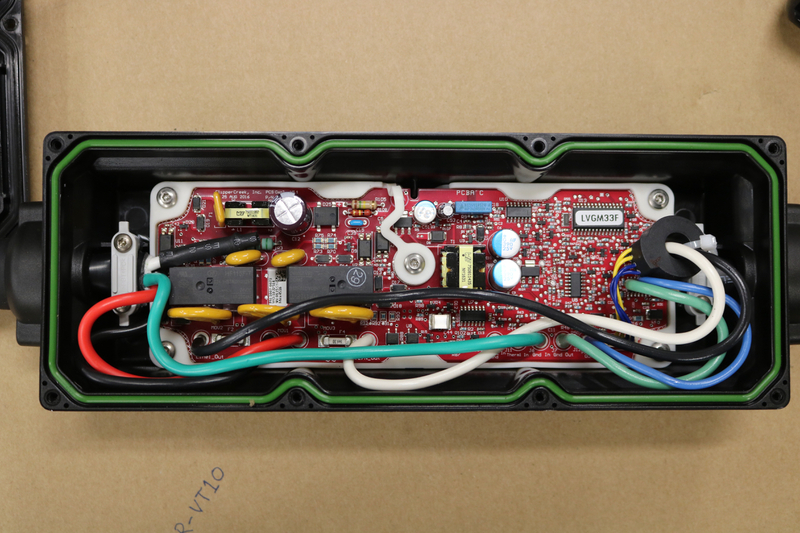 I’ve seen photos of the Volt EVSE, and the white neutral wire does indeed go to that hole. Further to the right, still on the bottom of the board, there are two unused holes referencing Therm1 and Therm2. Those are used on the Volt EVSE for a thermal sensor imbedded in the right-angle NEMA 5-15 plug. Volt EVSEs seem to have a history of poor quality, and running high current all night through a plain household wall outlet is a great way to create some heat. It’s good to see that the Volt EVSE now has this thermal safety. On the Amazing-E, running at 16 amps with that nice solid 30A connector, there’s no worries at all about heat. It’s overbuilt in a good way. Another nice thing about this unit is that it features a simple gasket inside the cover. By using tamper resistant screws, the manufacturer can use a reusable gasket, instead of a permanent glue. For example, twice now, I’ve fixed generation 1 Chevy Volt EVSEs. The case literally has to be broken open, and a hole has to be drilled through the case to access the last screw of the circuit board. Then the whole thing has to be glued back together after the repair! It’s not easy to work on and the case never looks as good after the repair. CAN IT RUN ON 120V? But can this unit run on 120V power? To find out, I’d need an adapter to be able to plug it in to a standard 120V wall outlet. After looking at what it would take to do for just one simple test, I thought it much easier to just instead rewire the 240V outlet to a 120V outlet. This is accomplished by pulling out the red wire, and screwing the white wire in its place. I tested with my volt meter, and sure enough, it read 120V between the two main blades the power plug. (The ground wire was left in place, and the red (Hot 2) wire was capped off with a wire nut.) I closed up the box, plugged in the Amazing-E, and went to the breaker panel. Well, at least the EVSE didn’t blow up. Instead of anything like the charger working on 120V or so dramatic as letting out the magic smoke, the EVSE simply blinked the red error light, indicating a fault. The software of the circuit board correctly identifies the voltage as being out of range for a 240V system, turns on the error light, and simply doesn’t let you charge. So, the answer is NO, you can’t use this as a Level 1 EVSE. Here are the pros and cons of this unit as I see them. Portable – It’s a nice size, compact. They even give you a tote bag to carry it in. NEMA 14-30 Connector – The plug on this unit is either a pro or a con, depending on how you look at it. If you don’t already have this style outlet, you will need to install one. In my experience, the 14-50 outlet is much more common in my area where I might want to use this in public. The upside is that the neutral blade of this unit could easily be cut off to make the unit compatible with both 30 and 50 amp connections. Minimal Cable Management – To deal with the cable, there’s only a Velcro tie included. The EVSE does also come with a couple of tote bags, which is probably exactly what I would have used anyways. Some EVSE, including portable ones, feature a way to wrap the cord around the unit when not in use. When hanging on a wall, there’s no place to hang the cord. 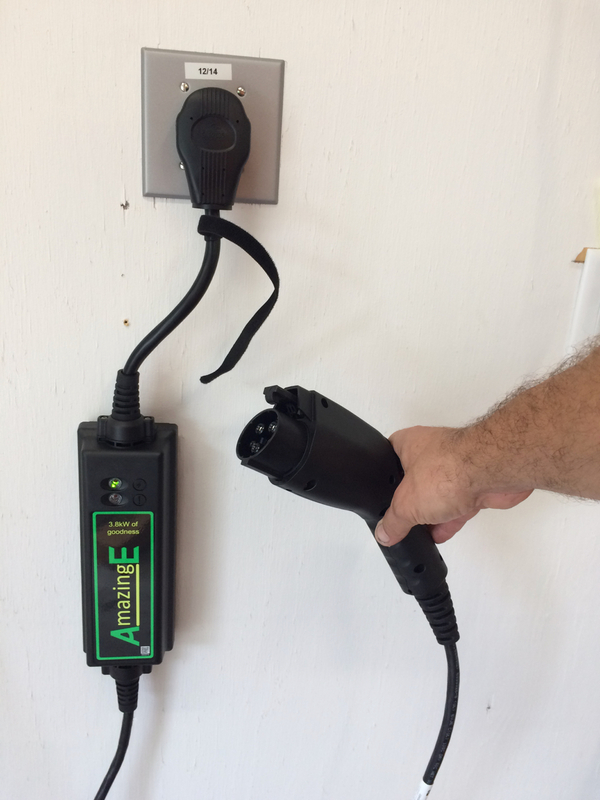 A user with this unit more or less permanently mounted on a garage wall will want to screw a hook to the wall to have a place to loop up and hang the cord. Fine, but not great mounting – Using two screws to mount the unit to the wall works well enough, but still feels like I’m going to know it off. Users might want to add some Velcro, a zip tie, or some additional way to make sure it’s secure to the wall. Doesn’t work with 120v – I have to say I’m a little disappointed in the lack of 120V charging ability. I was really hoping, as this unit looks so similar, inside and out, to the Volt EVSE which CAN do both 120 AND 240V charging. If anyone knows of a hack to make this unit capable of 120V, please let me know! Overall, the Amazing-E EVSE is a great little unit. It’s inexpensive, portable, and well-built. Unfortunately, it does NOT also run on 120V power. If your car has a high power charger or you also NEED 120V compatibility, you are probably best looking at some other (more expensive) units. For a practical, affordable, Level 2 EVSE, the Amazing-E is a great choice. PS: Full Disclosure. I am not paid in any way for this review. Nobody sent me a free EVSE or a check in the mail. I purchased this product to see how I liked it. If I blew it up, I’d have to eat that expense. I do these things to help promote clean transportation and educate the public about electric vehicles. My original Mitsubishi portable EVSE doesn’t work. I may end up using those parts for an Open Source EVSE, but that one ISN’T upgradable, the main board is fried. Ben: Thanks for this FANTASTIC review. Very comprehensive. I just ordered one, based largely on your review. Thanks again! MyAmazingE arrived and works great. A fabulous deal at $214, and provides all the power my Leaf’s 3.6 kW OBC can handle. WRT it being similar to the Volt’s EVSE, I’m sure you saw the Volt charger pics at https://imgur.com/a/vFkP5. The third photo shows orange & red wires from the Therm1/2 pads (N/C and empty in Amazing-E) marked going to “Thermal Protection inside 5-15 plug”. Likely a thermistor in the plug. Modding it work on 120V may be as simple as bridging those empty pads with the right value fixed resistor, determined by checking a Volt’s plug cord. Then possibly it won’t work on 240V, so maybe it would need to be switched out for 240V. But I also noticed different numbers on the IC stickers (LVGM33A), so the chips on the board may be different as well. For comparison, there is discussion about modding the stock Leaf’s 120V-only EVSE at http://www.instructables.com/id/313CONVERTING-A-2013-LEAF-LEVEL-1-12AMP-CHARGER-TO/ . The value of resistor there is measured as 22K. My spider sense tells me that it’s likely a standard value of resistance sensor (UL certification and all). Are you a gamblin’ man? The neutral pin REALLY DOES just dead-end inside the EVSE. Although it might feel strange, there really is no reason NOT to remove the neutral pin. Personally, I think I might try a Dremel rotary tool with a cut-off disc. That would allow you to cut off the neutral nice and flush with the rest of the connector. Give it a shot and let us know how it goes! Good luck! Ben: Thanks so much for the response. By the way, I am a former I-MiEV driver!!!! Leased for 2 years and then bought a used Gen I Volt(2012). Honestly, loved the IMiEV, but it was just not enough range for me in the winter and was too cold. It did not have QC option either which made it harder for me to drive. The Amazing-E is for the Volt. Since I have the option of running a 50 amp outlet outside(with by brother’s help of course, since I am dumber than dirt in regards to electricity), I am going to have him future proof things for the next EV I buy(my guess is it will be a used Bolt EV in a few years). Oh, since the A-E is a Christmas present, I cannot officially even open it up till Monday. I’ll get back to you after that, Lou. Yes, I highly recommend that people install NEMA 14-50 outlets in their garage or charging area. It’s definately the easy way to be prepared for a Bolt or any other car in the future that can draw more current. When I originally bought an EVSE for my garage, I got a 30 amp version (even though the iMiEV can only use 16) just to have available for other people to use at the higher charge rate. Works great. I think you meant; under closer inspection it appears not to operate on 120V at all, only off 240V, therefore it’s only a 240V level 2 EVSE… Right?! Whoops! Yes, good catch on the “typo”, I fixed it. I’m just one guy writing this, and it’s hard to always edit one’s own work! This unit runs on 240V but NOT 120V. Level 2 Only. Do you know if this works with the Honda clarity Plug in?